I don’t know of any meal involving pork that isn’t good, do you? Emeril swears by the goodness of pork. This meal is so good it will even fool ya mama into thinking you slaved away in the kitchen all day. This week we are paying tribute to all that is New Orleans and making delicious food celebrating Mardi Gras. Stick with me and by Fat Tuesday, you’ll be gobbling up jambalaya and screaming “ throw me some beads mistah“! 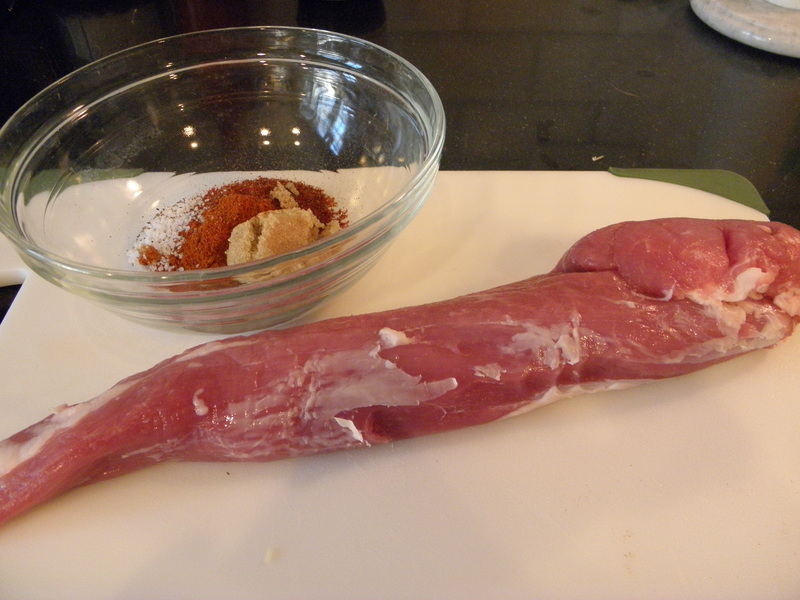 Trim pork tenderloin of any visible fat. In a small bowl, mix together chili powder, paprika, brown sugar, salt and pepper. 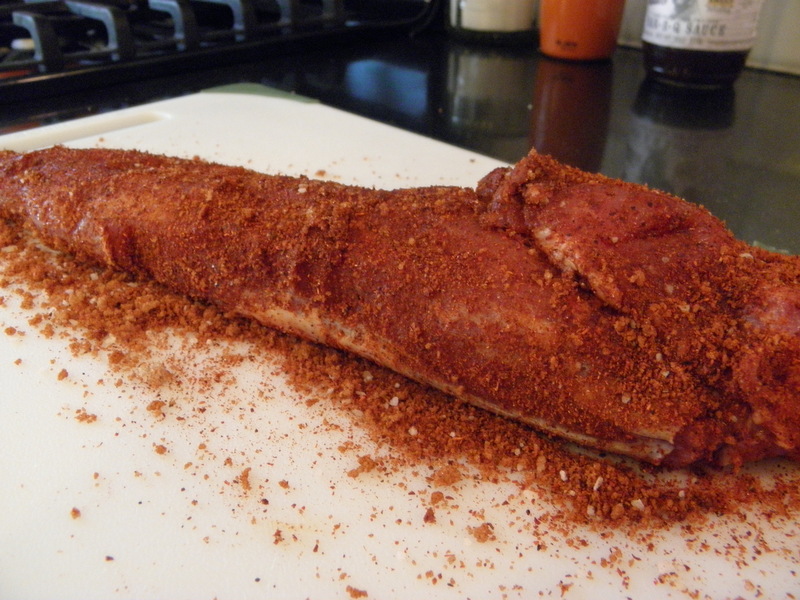 Rub mixture onto pork tenderloin and let come to room temperature. Heat olive oil over medium-high heat in a large pan and sear tenderloin a few minutes on each side until lightly browned. Place in a roasting pan and continue cooking in a 425 degree oven for 15-20 minutes. The meat will register 155-160 degrees when done. Let meat rest 5-10 minutes before slicing. 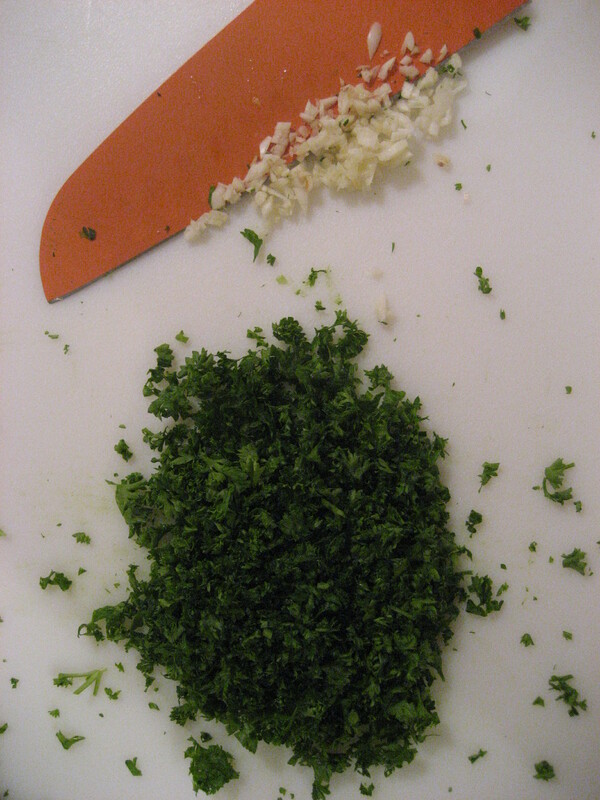 Set pan aside with pork drippings and seasonings to use for collard greens. Cook grits according to package directions. 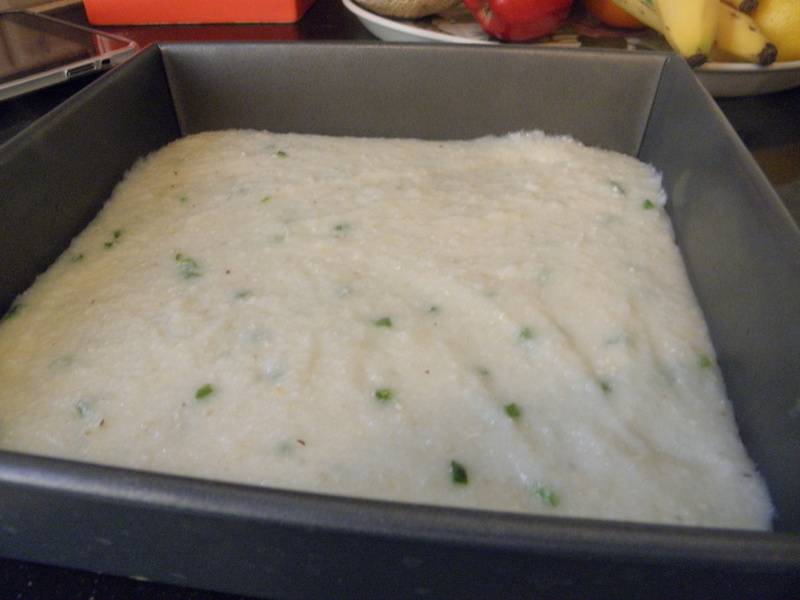 Then stir in remaining ingredients, when cheese has melted pour grits into an 8×8 pan and put in fridge to chill. 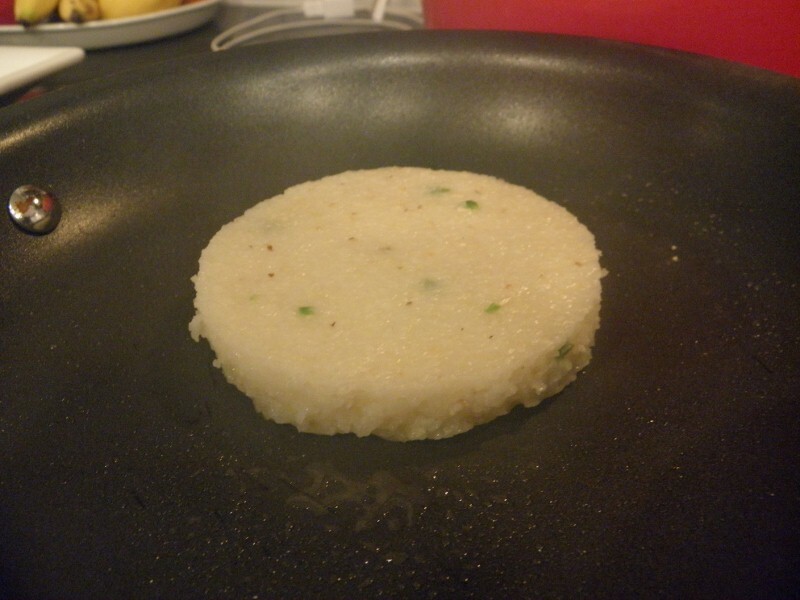 Just before serving, remove grits from fridge, cut into desired shape and heat grit cake in a skillet over high heat. In same pan that pork was seared, cook one slice of bacon over medium-high heat. Remove bacon and gently wipe excess grease out of pan. Pour chicken broth into pan and deglaze, scraping up all the seasoning from the bottom. 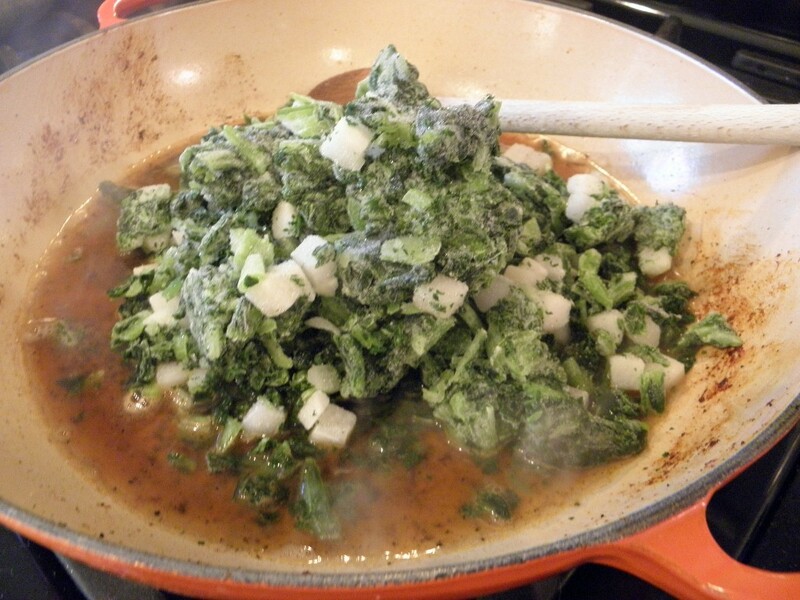 Add frozen collard greens, bring to a boil and then turn down to a simmer. Let cook for about 15 minutes and then add vinegar and crumbled bacon just before serving. You may either use canned peas, rinsed and drained or cook frozen peas cooked according to package directions. 1. 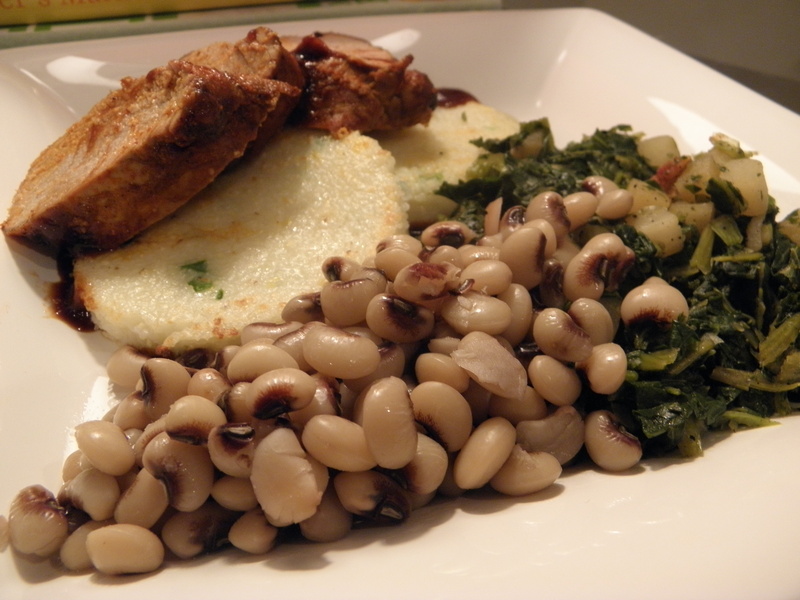 If using frozen black-eyed peas put them on to cook. 2. Season pork tenderloin and set aside to come to room temperature. 3. 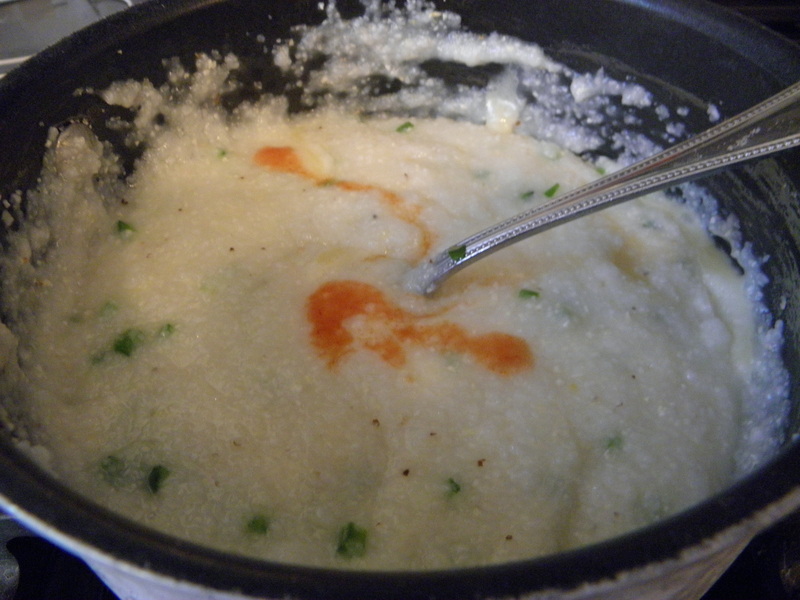 Cook grits, stir additional ingredients, pour in 8X8 pan and place in fridge to chill. 4. 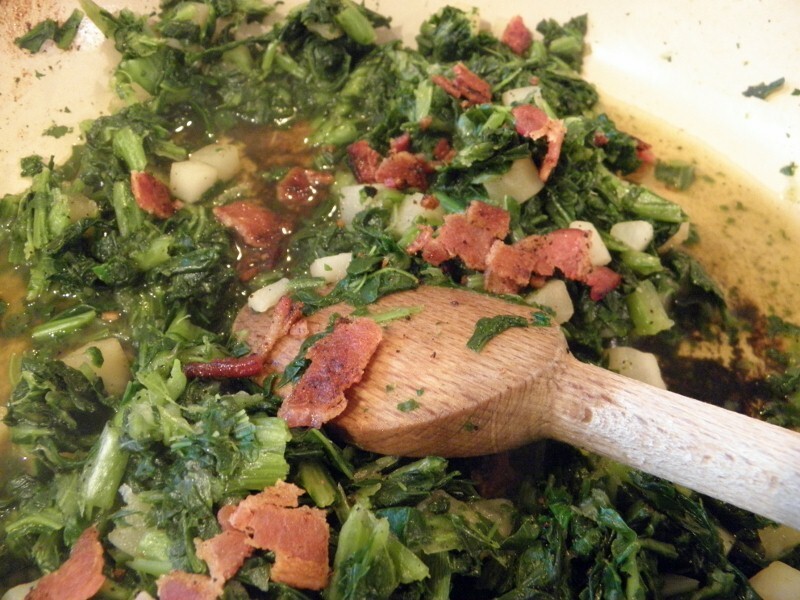 Fry bacon in skillet and put collard greens on to cook. 5. Pop tenderloin in the oven to cook for 15-20 minutes. 6. When tenderloin is finished cooking and resting, cut and heat the grit cakes. Before plating, drizzle a little of your favorite barbecue sauce on the plate for the pork tenderloin to sit on. 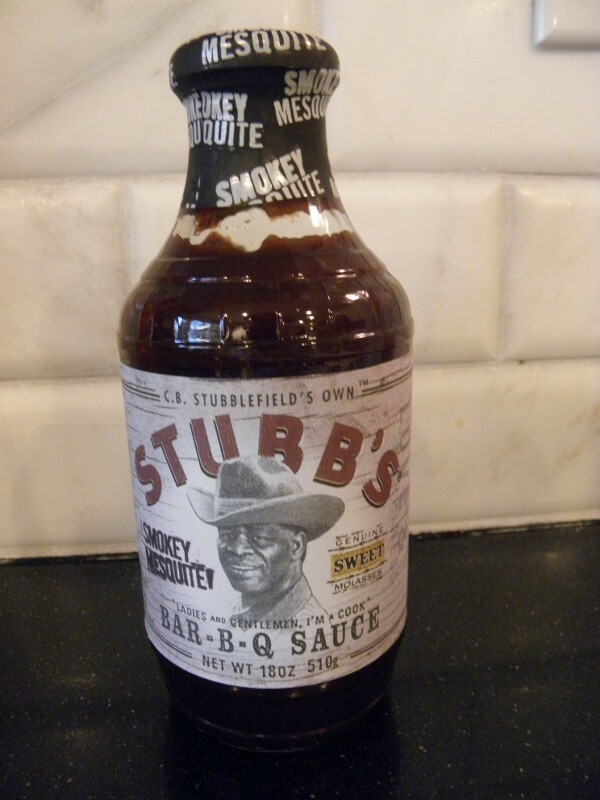 My favorite is Stubb’s from Austin, Texas – it’s super thick and tangy! 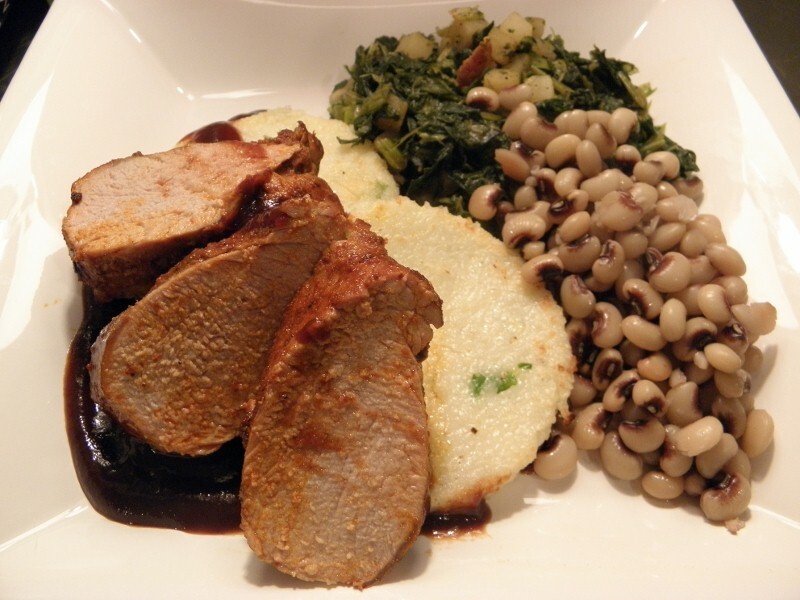 This entry was posted in Main Dish, Side Dishes and tagged bacon, balck-eyed peas, bbq, collard green, cooking, dry rub, Food, grit cake, grits, jalapeno, main dish, mardi gras, new orleans, pork tenderloin, recipe, southern, stubbs, vegetables on March 2, 2011 by lolleigh. My high school sweetheart took me on a our first date to Dotson’s in Franklin, Tennessee. He must have figured out this was a good way to win me over because it has always been one of my favorite places to eat. When it came time to break-up, I couldn’t think of a better spot than right back where we had started, Dotson’s. There’s something about that looming list of fresh vegetables and meats that serves up comfort. A big plate of biscuits and cornbread, vegetables served in small bowls and big glass of iced tea to sip on while you gaze around at the hundreds of country music stars autographed glossies that hang on the wall are what make this place an institution when comes to meat and threes. 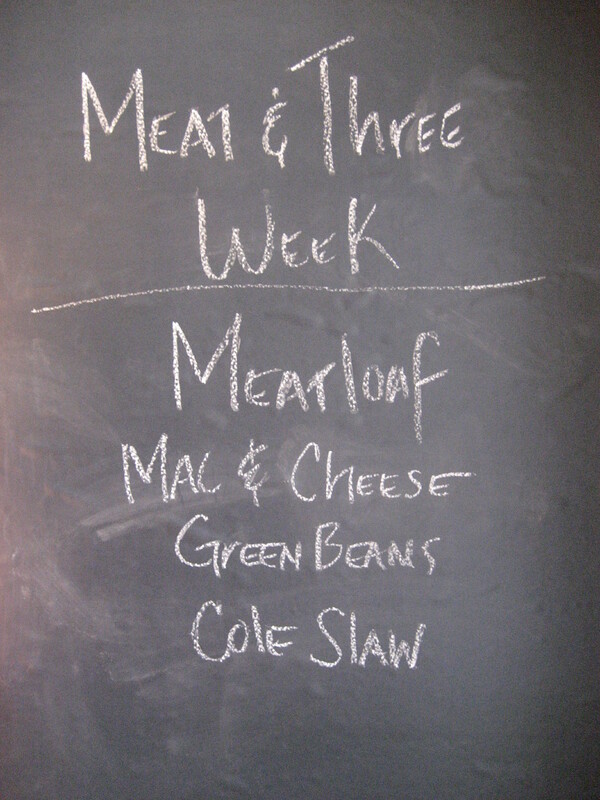 First up on my tribute to meat and threes this week is meatloaf. It’s the cornerstone of any meat choices keeping up this southern tradition. Stick with me this week and by the end you’ll have the recipes to build a perfect meat and three to enjoy right at home! Heat olive oil over medium-high heat in a small skillet. Saute onions and bell peppers for 5 minutes or until tender. Place ground meat in a large mixing bowl, season well with salt and pepper, add oatmeal, Worcestershire sauce, egg and tomato sauce and cooked onions and peppers. Combine well – using your hands works best! 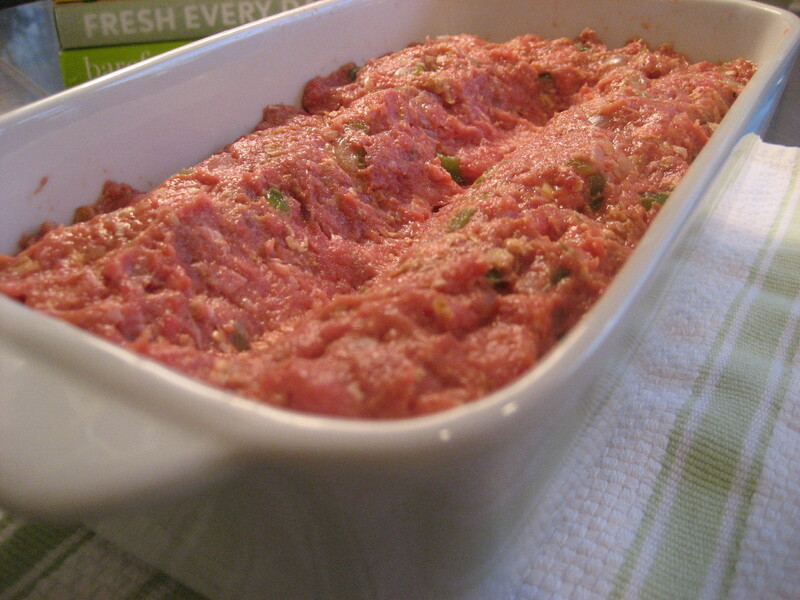 Place meat mixture in a medium loaf pan and gently form a loaf. Do not mash down meat. Make a shallow well down the center of the loaf. Mix all ingredients well and set aside. 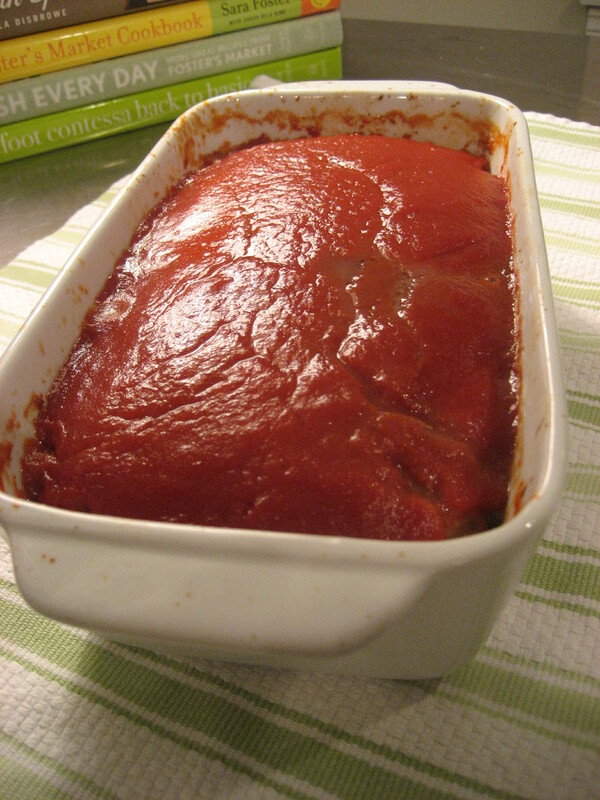 Place meatloaf in the center of the oven. 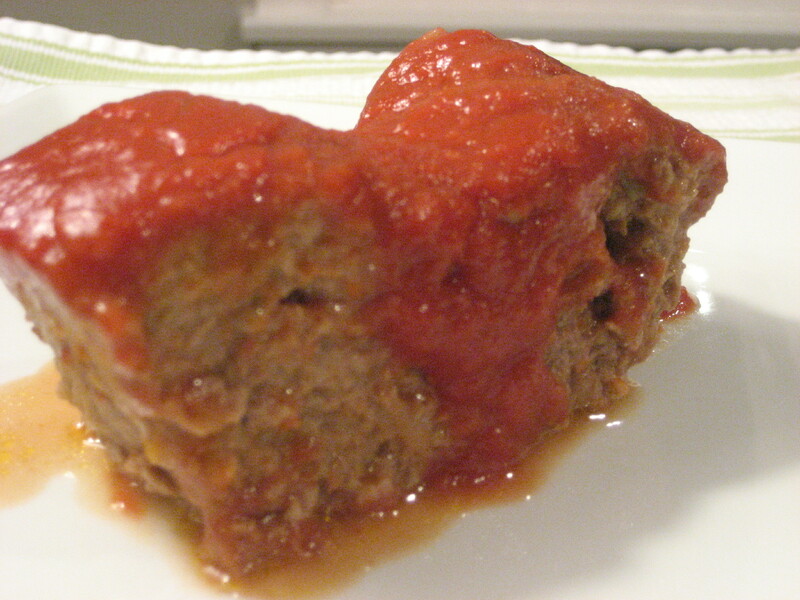 After the first 15 minutes of baking pour the tomato mixture over the top of the meatloaf and continue cooking for 30-35 minutes. Bake time will be a total of 45-50 minutes. You can always check the temperature to make sure it is cooked through. The temperature should register 160 degrees. Before serving let meatloaf rest for about 5 minutes. I like to use no salt added or reduced sodium products whenever possible. By adding your own salt when cooking you can control the amounts. I don’t like high fructose corn syrup. You’d be amazed how many products contain it; breads, spaghetti sauces, salad dressing and ketchup are just a few. 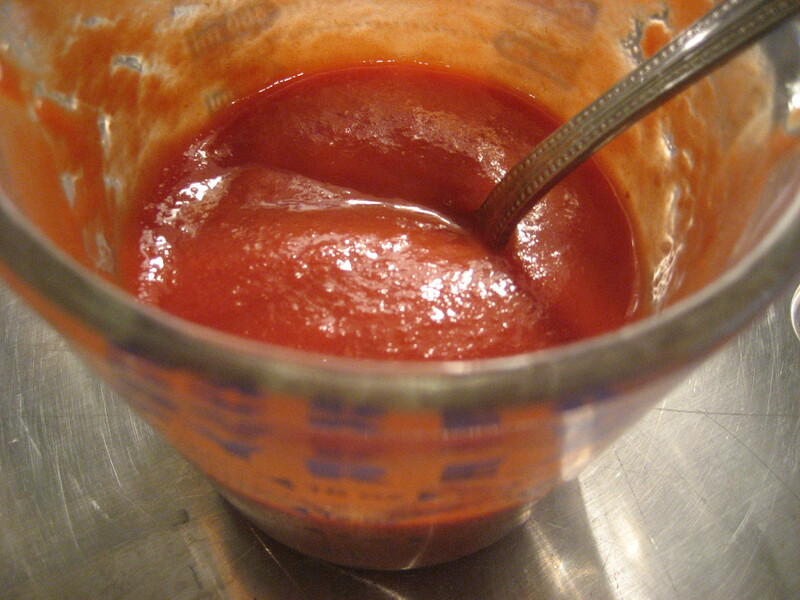 Look for products without it such as Heinz Simply Ketchup. The simpler the ingredients the better for you. I really like beef. Its easy to cut down on fat with ground beef if you buy leaner cuts. I like ground sirloin with a 95/5 or a 93/7 content. This entry was posted in Main Dish and tagged baking, cooking, dotsons, Food, franklin, ketchup, main dish, meatloaf on January 31, 2011 by lolleigh. I have had a love affair with Texas my whole life. It started early on with Bud and Sissy in Urban Cowboy. This was way back when HBO only played two movies all day and I would sit in my jeans tucked into my boots on the arm of the sofa enamored by Gilley’s. I remember my dad took a business trip to Houston around this same time and all I asked for was a Gilley’s t-shirt. Sure enough he delivered and that shirt hardly ever left my body! Girls drive trucks – real big ones and they look cool driving them! Designer jeans aren’t just for clubbing – showing cattle is a very dressy affair. On my first trip to the Houston Livestock Show & Rodeo, I stopped in the restroom and saw dozens of teenage girls decked out in designer jeans, shiny belts, flat-ironing their hair and primping for their turn to show. Goats aren’t just for petting zoos – I worked at the Brazos County Expo Complex where we hosted many livestock shows. During one of my first shows I became taken with the goats. They were so cute and I had a few favorites until I looked up at the sign where it advertised ‘meat goats’. It was then I learned all about livestock shows. You never meet a stranger, Texans are super friendly. 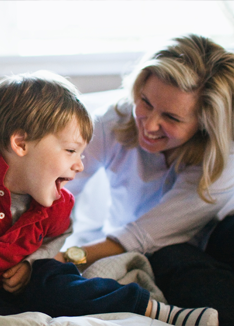 You can make a lifelong friend standing in line at the grocery store. Place meat in a large Ziploc bag. Combine remaining ingredients, whisking together well. Pour over the meat and place in the fridge for at least 8 hours. Before cooking meat, set out the Ziploc bag and let it come to room temperature. Heat a grill pan, grill or heavy skillet to high heat. Place the steak on the heat and do not move for 4 minutes. Once 4 minutes has passed, flip the meat and cook for another 4 minutes not disturbing the meat. Once cooked, remove from pan or grill and place on a cutting board letting the meat rest for at least 5 minutes before cutting. Cut across the grain into thin slices for best result. 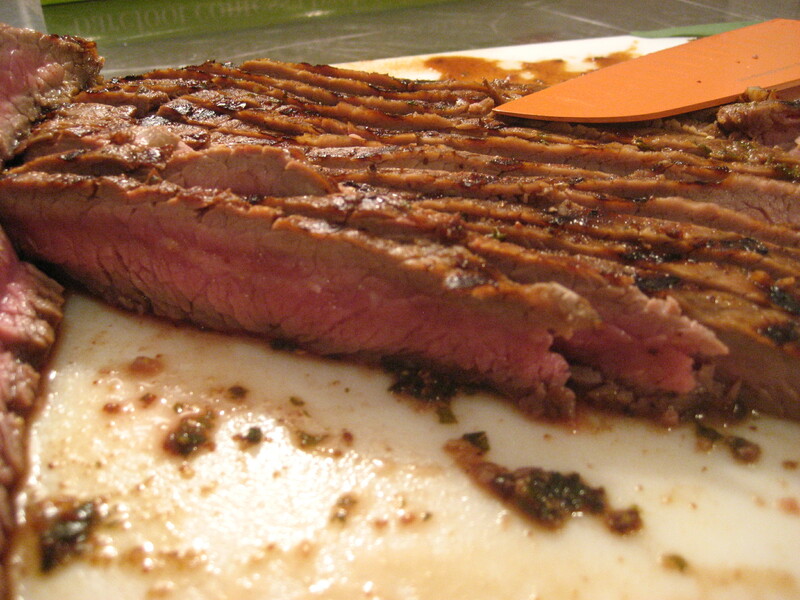 Flank steak is a lean cut of beef and requires a little more attention. 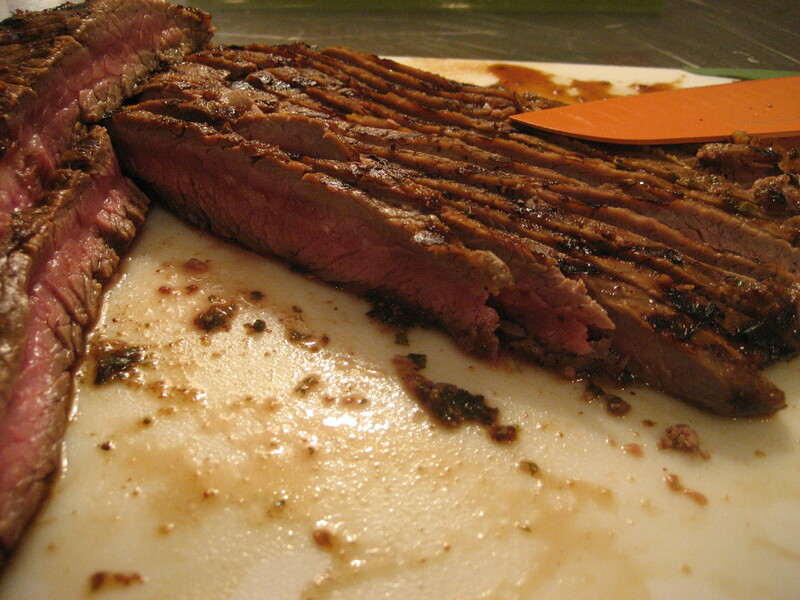 Cooking at a high temperature seals in the flavor and allowing the meat to rest will hold in the juices. If you have leftovers, you can make a great steak taco ! I used my Cuisinart indoor grill for this recipe. This entry was posted in Main Dish and tagged balsamic, beef, Brazos County Expo, Cuisinart, dijon mustard, flank steak, Food, Gilley's, grill pan, grilling, Houston Livestock Show and Rodeo, lean, lessons, main dish, marinated, recipe, texans, Texas, Urban Cowboy, ziploc on January 25, 2011 by lolleigh. When I was in college I volunteered myself to cook for a dinner party my Nana was hosting. Looking back, I was pretty confident to cook an entire meal for my Nana and her friends. These were the same ladies whose recipes appeared in one of my beloved cookbooks, Gazebo Gala. The recipes were deep in southern traditions, full of butter and of course delicious. Pecan Crusted Chicken Breast with a Dijion Sauce, Broiled Stuffed Tomatoes, Asparagus and Chocolate Tarts. Once I had sauteed the chicken and it was ready for the oven – we realized the oven was stuck on broil! My dinner was literally going to go down in flames. I calmly sat on the stoop to smoke a cigarette ( this was college!) and came up with a game plan. I decided to rotate the chicken, tomatoes and rolls under the broiler until I got them finished. It worked and the dinner party went off with out a hitch. The chicken recipe called for 10 tablespoons of butter and 2 tablespoons of safflower oil. Not only that but the chicken was entirely coated in pecans! To say the least it was a very decadent dish. I came up with this healthier version a few years later. You could use chicken but I prefer using pork tenderloin. Pound pork into 1/4 inch medallions, season both sides with salt and pepper. Coat pan with canola oil spray and over medium heat cook medallions about 3-4 minutes on each side. Remove from pan and keep warm. Turn heat to low and add chicken broth to deglaze pan, scraping the bottom to get up all the bits of flavor. The add sour cream, mustard and salt and pepper. Stir until a smooth consistency being careful not to boil sauce. 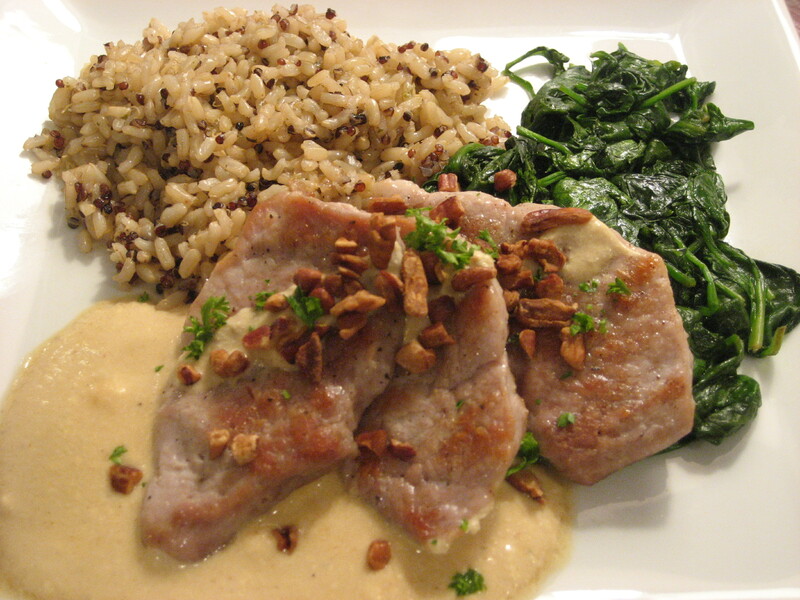 Serve pork medallions with mustard sauce and topped with a few toasted pecans pieces and chopped parsley. I use light sour cream for this dish – be careful not to get too hot or the sour cream will seperate. I usually serve the medallions with whipped sweet potaotes and sauteed spinach. Tonight I was in a hurry so I heated up a package of quinoa & whole grain brown rice. 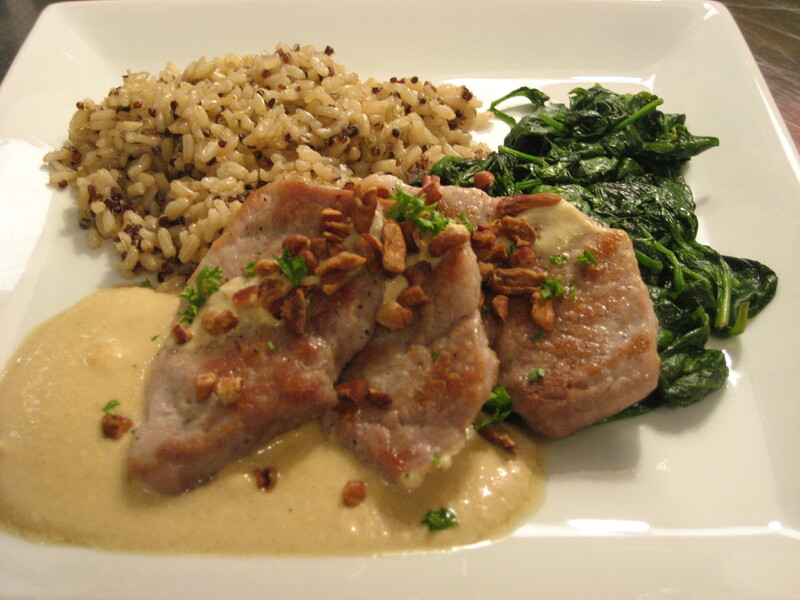 This entry was posted in Main Dish and tagged cooking, dijion mustard, Food, main dish, pecans, pork, Sauté on January 20, 2011 by lolleigh.